For the last and final day of Kids Delight – Fruits all forms, I took the easy way out! I decided to finally make this Classic Banana Split that I have read so many times in Enid Blyton books. Growing up, I never had some of the experiences that kids in those books seem to have. And that always made me want to do it right away. Of course I don’t think in ’80 or ’90 our market place had such well established parlors. It was only much later the Ice cream parlors became much more expanded and offered so many options. I still remember the Milky Way, an exclusive Ice Cream shop that opened up in early ’90s and it used to sell the ceramist ice creams. We used to regularly visit and enjoyed their creations. Previous to this, we used to get standard ice cream flavours and you don’t have an option to mix and create. However even then I don’t think I would tried a banana split. Having decided on this, I alerted Konda that she will have to taste something new for me. Kids were so excited when they saw the ice creams and the boys even said they won’t mind trying out strawberry. Imagine that! Especially with banana in it. That single bowl was not enough and Konda gave up trying to get her share, boys enjoyed it so much that they didn’t realize that they completed all the ice cream scoops along with the banana added. 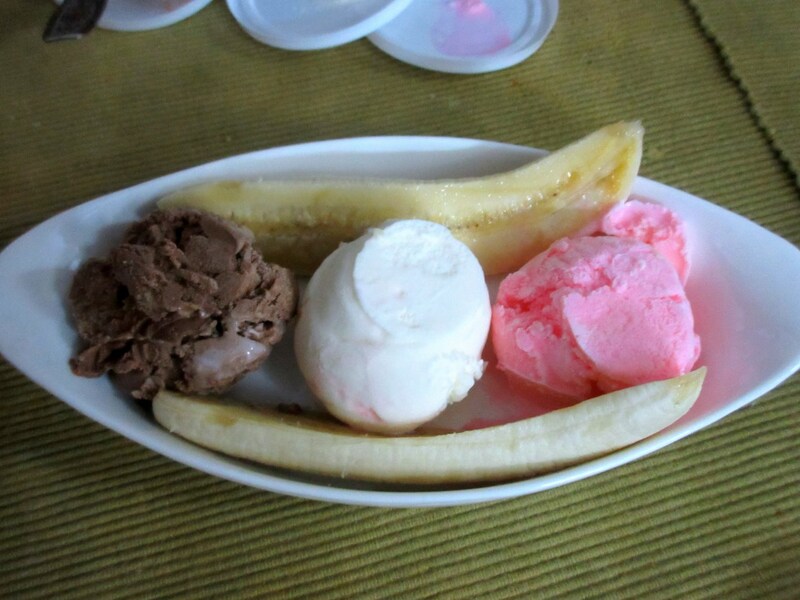 Late 90s had some icecream shops cropping up, but it was in Eden, Besant nagar that I had my first banana split. I am glad your kids loved this, even with the strawberry in it ;-). 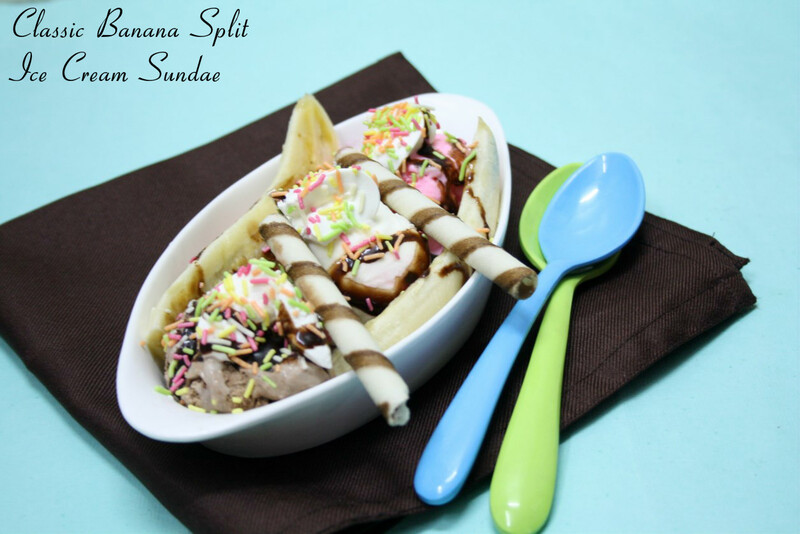 Banana Split brings back loads and loads of nostalgic memories. One of our favourite desserts , awesome job rhere. oh you took me back to my school days where no worry of calories and indulging in ice creams were so exciting and fun!! banana split looks fantastic.. Loved your presentation and it must be delicious..A quick fix for desert on summer days..
Banana split is on my to-make list. I've my son all reeled up with anticipation (just showed him your pics too), hopefully I'll get to make it for him soon. I can imagine how delicious this sundae must have tasted — so yummy!! Banana split makes me nostalgicm wish to finish that whole plate..
Banana split sundae looks so tempting.Nicely presented..
Love bananas in any form and this looks irresistible. When kids love something we make, it is such a satisfying experience, right? Love this version. you garnished it so beautifully as though it were in the parlor itself! 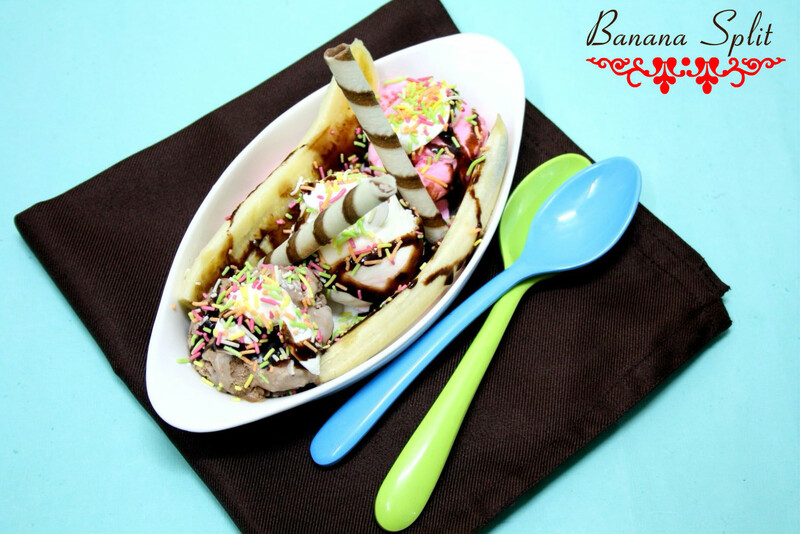 drooling over these banana split icecream..looks too tempting..